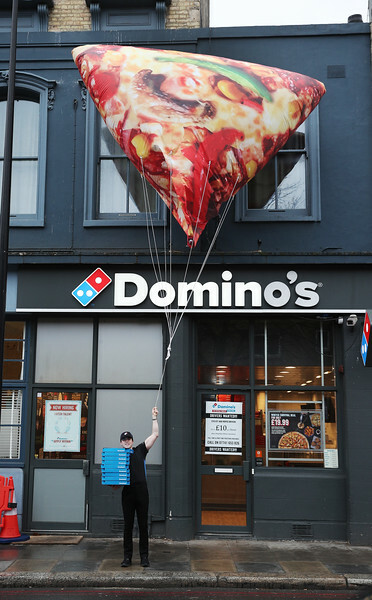 To celebrate the introduction of a new range of 650kcal Delight pizzas to its menu, Domino’s is floating giant, inflatable Slices of Delight around London today to help lift the January blues. 1,000 people who spot and share a picture on Twitter using the #SliceOfDelight hashtag will be rewarded with a free Delight pizza. Pizza lovers across the country can retweet the snap from @Dominos_UK to also be included in the 1,000 lucky winners. The range consists of two new additions to the menu, the Delight Chicken and Delight Vegi, with both using Domino’s signature fresh dough hand-stretched thinner and topped with a light scattering of reduced fat mozzarella. FREE FOR EDITORIAL USE - To celebrate the introduction of a new range of 650kcal Delight pizzas to its menu, Domino’s is floating giant, inflatable Slices of Delight around London today to help lift the January blues. 1,000 people who spot and share a picture on Twitter using the #SliceOfDelight hashtag will be rewarded with a free Delight pizza. Pizza lovers up across the country can retweet the snap from @Dominos_UK to be included in the 1,000 lucky winners.